Page 18 was different in the sense that I colored the whole thing with my wacom, rather than using a mouse + wacom or just a mouse. I think it looks better in spots, and it was also sort of easier to control in places, but overall I think it took longer to do and I'm not sure if people mind one way or the other (so long as it looks spiffy and consistent). I suppose time will tell, if comments come in saying "oh the new way looks better" then I might consider doing it this way from now on. However if no one seems to notice then I'm going with the faster way. One thing I have considered over the years is that no one really judges a piece based on the amount of labor that goes into creating it, but only the end result. So putting a ton of effort into something only for the sake of doing so is a waste of time. In other words, if people enjoy something that takes less work as much as something that takes more work, the former is better than the latter. So in this case, I'm thinking the old way is best. However, I think maybe when/if I start a comic of my own I might just drop the effort and just draw, baby . So long as people are entertained and enjoy it, that's fine w/ me That's my main goal anyway. Anyway, that was a digression, this Behind the Punch thing isn't a blog afterall! But..uhhhh page 18 was done in a different style, etc.. After it I decided to go to a combination of wacom + mouse. Before 18 most pages were done 100% with a mouse, only a few used the wacom. The nature setting panels on 10, 11, and 14 for instance. They were drawn normally but "colored" with a wacom. Last edited by MSperoni; 10-02-2009 at 08:34 AM. Here are the concept sketches of our unloveable assassin duo, Zi Jiao and Zi Bao (their names are written in reverse on the pics). I'm not sure if they're relatives or if they just have the same Family Name "Zi". I tried to make Jiao look somewhat like a snake, and then Bao look kind of like a turtle. 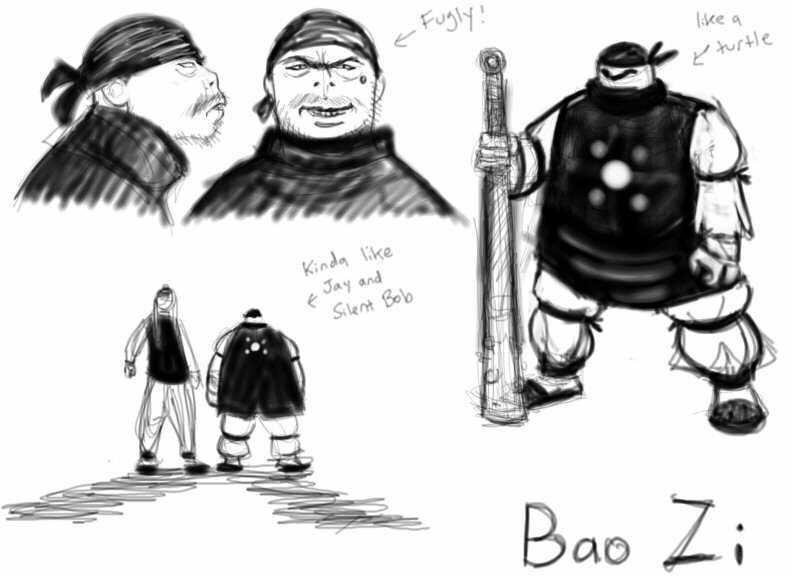 Bao was also somewhat inspired by Daisuke Kato's character "Inokichi" from the movie "Yojimbo", although Inokichi resembled more of a pig than a turtle. The pattern on Bao's outfit (the circles) was dropped. It had something to do with Wu Xing but I felt that somehow gave Bao "rank" over Jiao. They don't really have a hierarchy, though I suppose Bao is the more clear-headed of the two. He may look like an oafish turtle, but he's not. 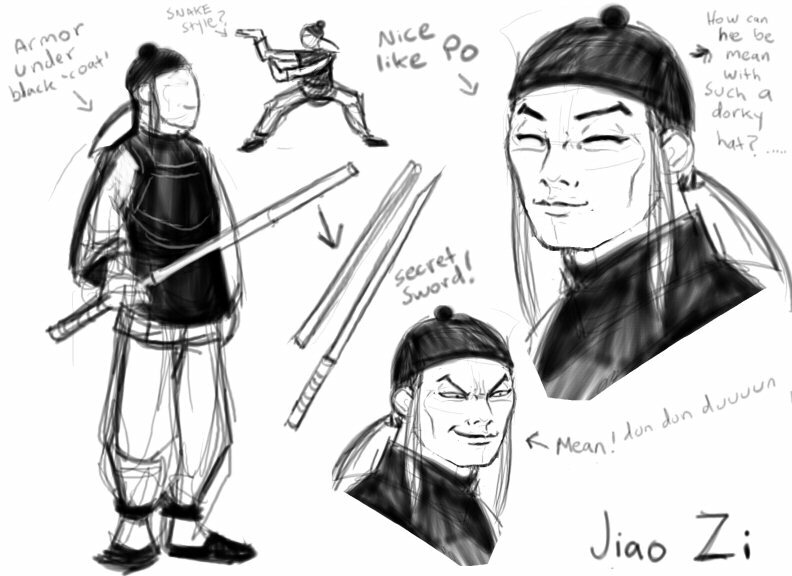 Jiao is more of a sadistic type, somewhat more of a wild-card I would say. We had to come up with a reason for Jiao to be walking alone when Wong approached, so Bao was made hideous to "explain" that. I doubt a little kid would approach someone like Bao, so Jiao had him hide. Jiao, when he's not in his "evil mode" doesn't really look all that scary. I also gave him the "Po look" to sort of associate him with the only (so far) friendly character Wong has met (aside from his servant waaaaaaay back on pages 6-8). I do like how opening Jiao's eyes instantly changes him from harmless traveler to a creepy evil assassin. 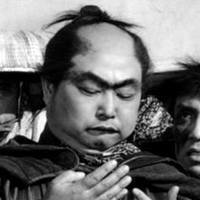 What is it about all these characters and their crazily expressive eyebrows? Been awhile since the last Behind the Punch Update. Seems like every time I have a few images to post, Brian's never around to put them on the site and when he is around I forget to ask him. There haven't been any new characters in awhile so there have been no new character designs to post. I think when the fight scene is over with I will post a type of layout compilation image of each page in the fight. As well as panels I tossed out. For now, I suppose I can show previews to a picture I'm working on. This picture is a gift to the site as thanks to the people who donated money in the recent "How I Killed Your Donation Drive". Not sure if this is the best place for this question, but I feel it needs to be asked: With such a positive reception of your art, even outside of HIKYM, specifically as related to the 8-Bit Theater series - do you and Brian have any plans to utilize your skill for official merchandising? We all know how the shirts thing goes, but specific prints and the like would be neat. Hurray another "Behind the Punch" update! This time with actual STUFF to show! 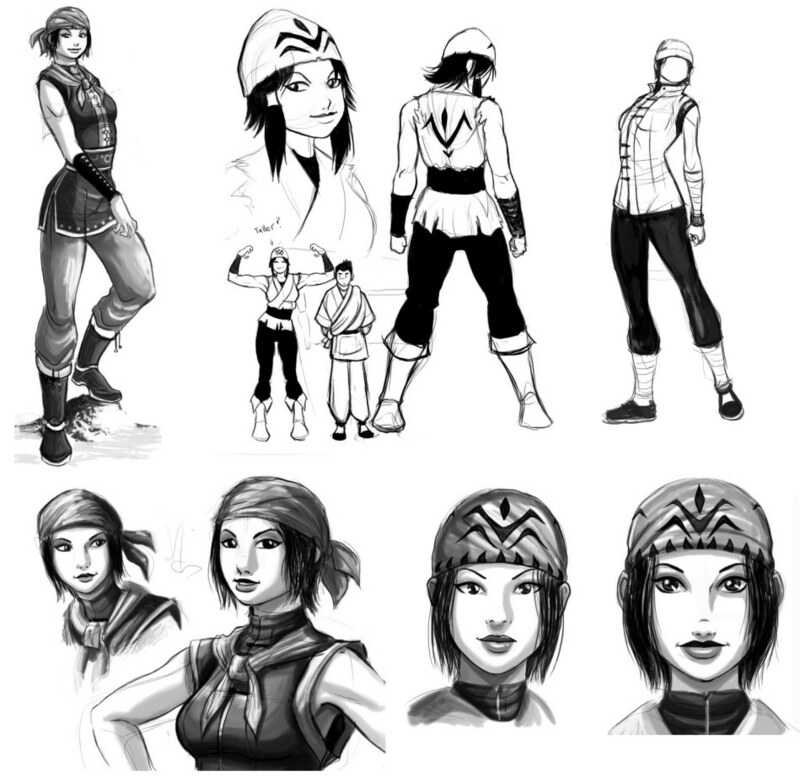 Here are the concepts to our newest character and first girl, Fang Lin. You can probably guess which one I settled on. Originally she was going to be about Wong's height but I thought it might be cool for her to be taller. In this case, Fang is the power fighter and Wong is the fast one (which I guess reverses the stereotype). I like the last two images of her face, however they seemed to dainty and pretty for the type of character I wanted her to be. Those faces don't have enough fire in their eyes for Fang Lin. I draw and color MEGAFAST (see?) now because I think I work more instinctively, not to mention I can get my work done with time to spare. Pages take maybe 6 hours to draw and 4 to color, sometimes less. There are some upcoming pages I managed to get done in a single day. The server time is now 10:24:59 PM.